What is the single most important factor in determining whether you should buy a particular stock? If you posed this question to a room full of investors you would get a myriad of different responses. The fundamentals. The technicals. The uniqueness of the product or service. Research and development. The management team and on and on. For me there is only one answer and it’s so simple I’m hesitant to state it. But here it is anyway: Are intitutional investors buying this stock? It is this group, not you and me, who move the price of an equity north. These are the mutual funds, hedge funds, and money managers of banks, insurance companies and pension funds. So how do we find out what these “big boys” are up to? One way would be to surreptitiously sneak into their board room meetings and listen in. However, this approach is illegal and may require the use of Woody Allen eyeglasses with the furry eyebrows and big noses. Another method is to check out the price charts of that security, technical analysis. If we see an uptrending moving average with confirming technical indicators, we know that these players are taking positions in this stock and the momentum will be in our favor to join the party. In order for us to feel confident in this approach, there needs to be transparency and accuracy in the prices and volumes reported. This is not an issue with the major exchanges but there is a hidden world of investing, called dark pools, that may be skewing the numbers and effecting our investment decisions. This is a slang term that references the trading volume created from institutional orders, which are unavailable to the public. The bulk of dark pool liquidity is represented by block trades (10,000 shares or more, not including penny stocks) facilitated away from the major exchanges. It gets its name because details of the trades are concealed from the public, clouding the transactions like murky water. In essence, they bring together buyers and sellers behind closed doors. These trades are considered legal and necessary for the health of the market but do bring up concerns for average Blue Collar Investors. Huge trades can be made without institutional investors tipping their hands as to the their actions, which they say, can affect prices. Who runs the dark pools? They are run by brokerage firms such as Goldman Sachs and Fidelity Capital Markets, as well as brokers and other firms. There are currently over 40 dark pools. When the smoke clears, nearly 20% of Big Board stocks change hands in the dark! Because the NY Stock Exchange is losing market share to these dark pools, it is taking action. In a joint venture with BIDS Holdings, a dark pool owned by the major Wall Street firms, the NYSE is luring back these block trades-the large transactions this exchange once dominated- by allowing hidden prices. Who is watching out for us ? James Brigagliano, co-acting director of the SEC’s Division of Trading and Markets is watching our backs. In Traders Magazine on May 21st, 2009, he said that dark pools could impair price discovery by drawing valuable order flow away from public quoting markets…..” could adversely affect the execution quality of those market participants who display their orders in the public markets.” He stated that this could harm price discovery and worsen short-term volatility. There is much the SEC does not know about the dark pool business. The regulatory agency has no numbers of its own on the size of the dark pools, relying instead on industry reports (uh oh!). The SEC does believe, however, that it has a right to such regulation. In my view, there is currently nothing to worry about but the situation does bear monitoring. Garnering about 20% of the trading volume seems to serve a purpose for the institutional investors but not have a major impact on us. After the recent hits the SEC has taken (remember Bernie Madoff? ), the agency is all over this issue. The SECs director of trading and markets, Erik Sirri, has said that if the volume flowing to dark pools were to become much larger ( over 30% of the total according to analysts), that would attract the attention of the regulators. All we ask in this David and Goliath world of Blue Collar Investors trading alongside Wall Street Insiders is a fair chance, a level playing field. I believe that we currently do have that. Let’s keep an eye on those dark pools and ask that they not get greedy. Check out the greatest performing stocks in these industries and see if any belong on your watchlists. There were mixed signals from the Federal Reserve’s April meeting regarding the health of the economy. Stocks plummeted globally on the report that the Fed’s latest forecast for 2009 expects more contraction than the January forecast. On a positive note, the Fed has become more optimistic about the outlook for late 2009 and 2010. New residential construction declined 13% in April to a record low of 458,000 annualized units. Single family construction, however, was up 3% while multi-family units, especually condos were down more than 46% from March’s weak levels. This, in part, is due to builders’ restricted access to financing. The Conference Board’s Index of Leading Indicators increased 1% in April, the first monthly increase since June of 2008. For the week, The S&P 500 was up 0.5% for a year-to-date return of – 0.7%. Those of you trading or paper-trading covered calls, may be seeing the incredible power of this strategy when comparing your returns to that of the S&P 500. Thanks to your book, you provided me with a roadmap for stock selection to sell covered Calls. However, after reading Mr. Bill O’Neil’s book on stock selection, I’ve slightly modified his guideline in selecting stocks from the IBD 100 list. The requirements in this guideline will produce a shorter list of stocks to select from for selling covered Calls. Attached is the guideline. Please comment. Stock purchase price minus Call premium equal net price for stock. Divide net price by number of shares. This per share price is the no loss/no gain price for the trade. This assumed that the stock price stay below the naked Call price until option expiration date and the option will expire worthless. 1- I find that most of the stocks on my watch list ARE above $20/share. However, from time to time I find one slightly under. For example, I have generated outstanding returns from RHT the last few months. You may want to drop the requirement to $15/share. 2- Earnings requirements: The IBD 100 screens for top performers in annual EPS % change, last quarter EPS % change, and next quarter EPS % change. The SmartSelect Ratings screens for EPS Rating and SMR Rating which incorporates earnings figures. The Scouter Rating also incorporates certain earnings stats. That should do it, don’t you think? 3- New high in price: If I were deciding between 2 stocks exactly the same but one had recently hit a new high, I’d opt for that one. The problem is that you are eliminating all stocks that take a dip but may still be technically and fundamentally sound. Do you think this requirement may be too restrictive? 4- Volume surge: I love to see a volume surge of 50% or more when there is a change in a technical indicator. For example, if the 20-d ema moves above the 100-d ema on a volume surge, that equity has my serious attention. To make it a general requirement will drastically limit your choices. Also, be aware of a “false” volume surge that can occur after an ER. 5- Exit strategy: Using the option premium to “buy down” the cost basis of your stock and then buying back the option and selling the stock seems to be what you are suggesting. This is a plausible approach but there are many missing elements. First, there is no plan as to what to do next (sell stock, roll down, plan for the stock to go up and re-sell the option etc.). Also, would it pay to do this in the last week of the contract cycle? I could go on and on about this. My upcoming book on exit strategies addresses all these issues. Paper trade any new ideas you have. It costs nothing, can be a great learning experience and may enhance your system. Remember that you are also factoring in earnings reports, same store monthly retail sales reports, industry diversification and exit strategy implementation. These all require a strong watch list of between 40-60 stocks. Any screening system that is too restrictive may not allow for this. I’m glad that my input is worthy of your time to respond. Thank you. In your answer to the exit strategy; perhaps I didn’t explain the idea more clearly. I’ll try again. Stock purchased at $32.50. Sell $30.00 Call. Call premium received $4.00. Insurance $2.50. ROO $1.50. Should the market reversed, sell the stock at $28.50. This would result in a no gain/no loss trade, provided that the market trend is down and the risk of the now naked Call will expire worthless. Of course, if the market were to reverse again and turn up, then the naked Call should be closed and the premium paid is a loss. It’s a judgement call, but I feel market trend and time decay is on my side. When writing cc options, we are utilizing a low-risk, conservative investment strategy. Selling the stock while still being short the option position is much too risky. This is NOT part of my cc writing strategy. In addition, buying and selling naked options requires a more sophisticated degree of option experience before many brokerages will allow you to use it. In addition, you cannot trade naked options in self-directed IRAs (in the US). When we institute an exit strategy for cc writing, we first buy back the option (buy-to-close). We are now in a long stock position only and select from the choices described on pages 112-119 of Cashing in on Covered Calls. You are 100% correct that in the example you give, the breakeven is $28.50. To institute an exit strategy you would buy back the OPTION at a much lower cost than originally sold and then choose your next step (roll down, hit a double etc.). I hope this adequately answers your question. I encourage you to post your favorites on the comments links of these articles. I made my first real trade today: FFIV JUne @$30. Thumbs up on all screening. Here’s hoping. 1. I got stuck on a virtual trade for BIG. They announced monthly sales and it dropped below my downside protection. Are all retail stores verboten or do I have to check each retail store to see if they publish monthly sales? 2. If MSN Scouter has no rating available, does that disqualify a stock? 3. Is it possible to place a stop loss so that if the stock goes below a specified price, automatically both the stock is sold at market and the option is bought back at market. If it is possible, is it a good thing to do to avoid a catastrophic loss. I ban all these companies…why take a chance as you found out! 2- No, Scouter Rating does NOT disqualify a stock. These are usually ADRs (foreign companies trading on US exchanges). If they meet all other system criteria, keep them. 3- Every brokerage is different. Most will require buy-back of the option first so you are not in a “naked” option position. Some brokerages may have a “one triggers other” where the option is bought back at a limit price and that will trigger sale of the stock at market. What you may want to consider is to place a buy-to-close limit order of 10 -20% of the original option sale price and ask for email or phone notification if and when that trade is filled. Then you can decide on the best course of action (roll down, plan to “hit a double”, sell stock etc.) This way you are not tied down to just the sale of the stock as your only choice. Call your brokerage firm and ask about the choices you have given what you want to accomplish. I spell all this out in great detail in my next book which will be available in June. If you own several hundred shares of a particular equity, there is no law that says you have to sell the same strike contract on all of them. For example, if you own 400 shares of the Qs (QQQQ) @ $34.84 and you are not confident of market direction, you may opt to sell 2 contracts of the $34 strike and 2 of the $35 strike. More conservative investors will opt for the $34 strike; more aggressive investors for the $35 strike. You also may look to the $36 strike which will return about 1% with a great upside potential. 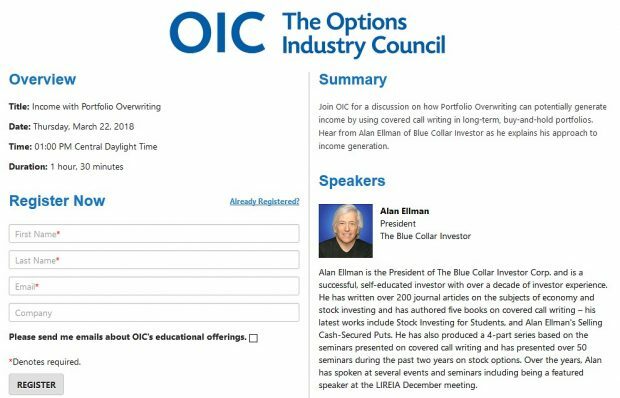 The book is packaged with a BONUS DVD: Expiration Friday Exit Strategies which can only be found on The Blue Collar Investor website. Fill out the pre-order form NOW and receive a discount of $5 per book. I am truly humbled by the response I have received in only the first few hours since my email. I will continue to work very hard to justify your support. Thank you for your answer to my input. I look forward to reading your new book on exit strategies. I would pre-order it, but I don’t know when it’ll ship. I am in the process of re-locating back to the U.S. next month and I’ll order the book once I’m settled. Can we make safe money in 3 weeks? Nothing is guaranteed but how about INT? We are guaranteed a 3-week return of 2.4% as long as our shares do not depreciate by more than 4.1% in the next 3 weeks. The example is taken from my book, “Exit Strategies for Covered Call Writing”. It will be showing on the homepage of this site starting tomorrow. It is a great example of how powerful exit strategies can be in increasing the CASHFLOW into your investment accounts. I never miss your weekly blog. It really helps my CC trading. I am anxiously waiting for your new book, which I have ordered. Your calculation of downside protection is different from the other calculations I have seen. I think the difference is in the definition of what is being protected. I see my downside protection as my breakeven point but it appears you look at from a profit protection angle. It that is correct, can you then call it profit protection? Does it also mean that you do not have a downside protection when you sell an OTM call? Your assessemnt is 100% correct. The $2.65 option premiumn will give us a 2.4% 3-week return PLUS a 4.1% downside protection of that profit. My system is predicated on generating a constant flow of cash, of profit, and that is why I break it down the way I do. If you add both components, you will get (approximately) the 6.4% you allude to. If the shares drop to $39.99 by expiration Friday, and are not assigned, you now own the shares @ $40 for next contract period calculations. I have found that this methodolgy is extremely helpful in determining how to get the highest returns, best upside potential or downside protection. WHATEVER YOU DO, DON”T GIVE THESE FIGURES TO YOUR ACCOUNTANT who may have a coronary if he sees them. I am working on an enhancement of the ESOC (calculator) to include a schedule D for your tax expert. Thanks for the explanation above. I had another question on this. I know one of the exit strategies you like to employ is what you call hitting a double or triple in the same contract period by buying back an option and then waiting for the stock to increase in value before selling another option with the same strike. Can you explain what the calculation would look like in this scenario? If the stock is trading at 39.99 at expiration would you still buy down the stock to $40 and use that as your new cost basis or would it be lower? Thanks again for your blog and all of the effort you put into helping the average person make great returns! As far as cost basis in the next contract period, I use the current market value of the stock. This way when you compare using the same stock versus another, you are comparing apples to apples. Using the amount you paid for the stock last month (higher or lower) has no relevance to your cc decisions at that point in time. My calculations are based on one goal and one goal ony: Making the most money with the least risk at that point in time. The ESOC is designed to compute all your calculations in this manner. My new book, Exit Strategies for Covered Call Writing gives dozens of examples WITH THE ASSOCIATED CALCULATIONS that will clarify all possible exit strategy situations. Okay, this makes sense. By the way, I’m just curious – have you ever hit anything higher than a triple in one contract period? I know it would have to be a pretty volatile stock to do this and possibly you would use the “turning dead money into profits strategy” if it was that wild. Some of the new Bull 2x and 3x ETF’s move like this so it may be possible. Thanks Alan! For 1-month options, I have never seen anything better than a triple. I’ve only had a few of those in twelve years of writing CCs. Doubles are more common. For those who write long term options, it is conceivable. If anyone hits a triple, let me know and I’ll include it in one of my journal articles. Any update to this May 2009 topic of darkpools? BTW, your parting comment, I think, was a little pollyannish “…Let’s keep an eye on those dark pools and ask that they not get greedy.” That’s like Greenspan saying that the banks could ‘regulate themselves’ when they were allowed to get into investments. Darkpools are being monitored closely by the SEC and FINRA. Based on articles I have read and people I speak to who are close to the situation it is more difficult than ever to take advantage of investing without transparency. I can also say the same thing about how shorting is being monitored. The system is NOT perfect but it is absolutley improved. When I come across information that is significant either way, I will definitely publish it on this site. I also agree with you that I could have phrased my concluding remark a bit better.